Posted: October 31, 2017 in Sports Racers, Who,What,Where & When...? It would be interesting to know the occasion of this factory PR shot, the DB3S first appeared at Charterhall in May 1953 so it seems unlikely it was about that model Aston. The clay model is also notable, in comparison with the final design, for the distance behind the rear wheel arch which is shorter on the production car than the clay. The DB3 was much more slab-sider than its younger sibling too wasn’t it? The cutaway front arch, such an outstanding feature of the DB3S design is clearly shown. The rendering on the wall behind the two fellows is also intriguing, I wonder what it is? 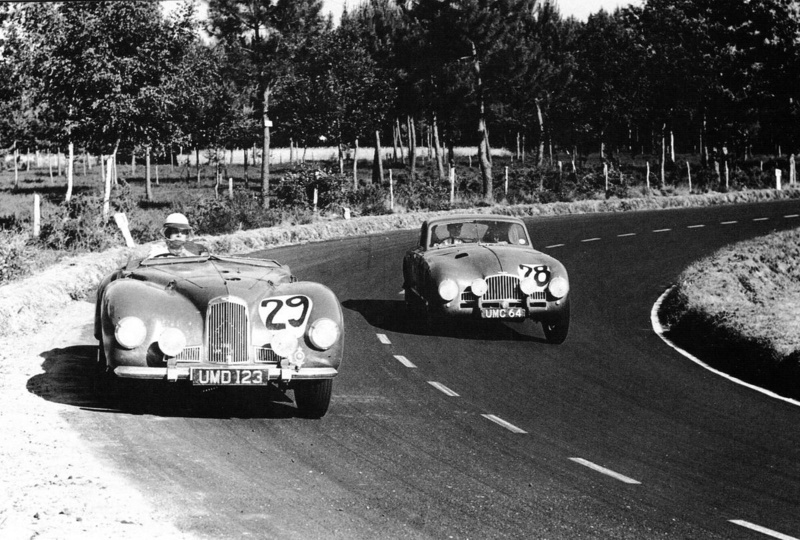 It seems odd really as he shaped all post-war Astons up to but excluding the DB4, most notably the DB3 and DB3S racers. 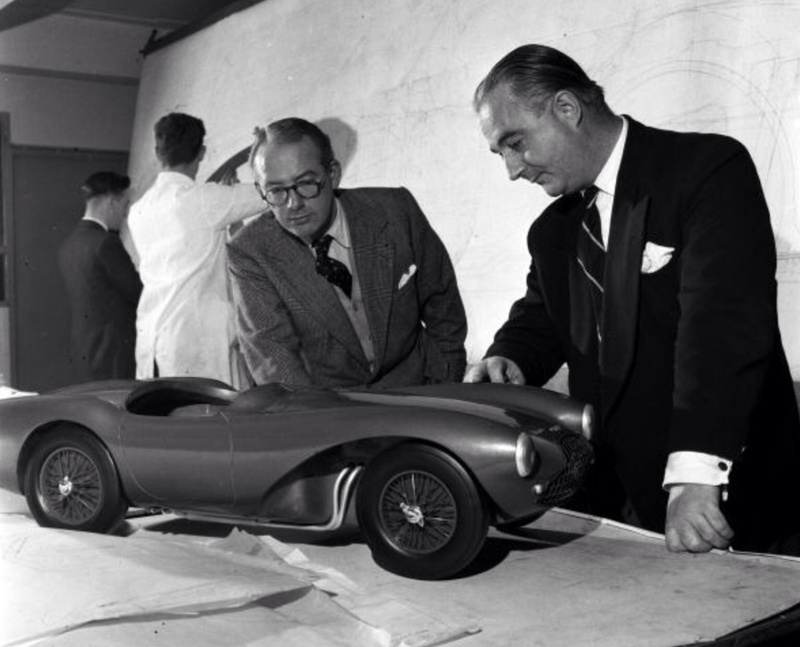 Feeley, whose father also worked there, joined Lagonda as a teenager at 14, initially he was the office boy under Arthur Thatcher, the assistant works manager. 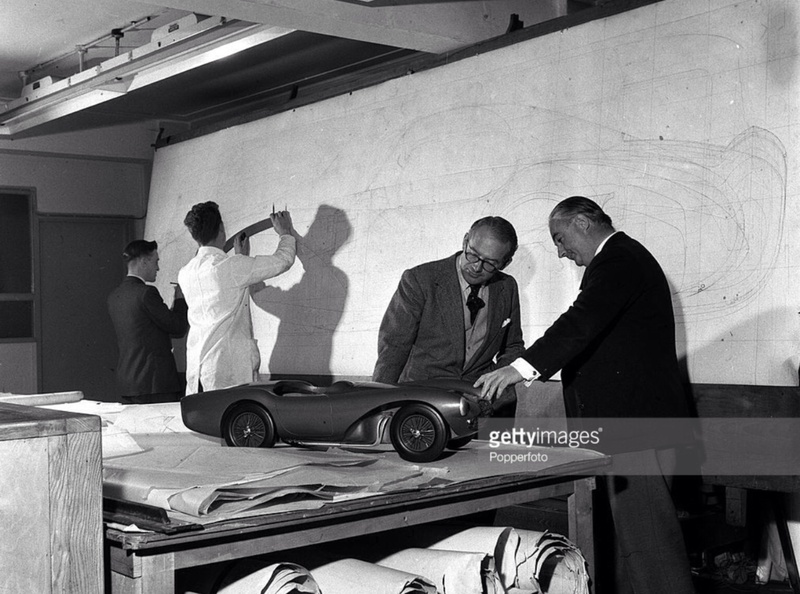 By 25 he was their ‘Body Designer’, succeeding Walter Buckingham. The commercial viability of Lagonda as an independent firm was weakened when Briggs Motor Bodies exited an agreement to build Lagonda’s bodies to take on more profitable and larger deals with Jowett and Ford. Lagonda had closed their own body shop, with times being tight, Feeley and WO Bentley were shown the door. David Brown bought Aston Martin, famously spotting a ‘For Sale’ advertisement in ‘The Times’, he paid the princely sum of twenty thousand- five hundred pounds for the business. Shortly thereafter he also bought Lagonda, creating, you guessed it, Aston Martin Lagonda. Needing a body man Brown approached Feeley who took on the role despite some misgivings. 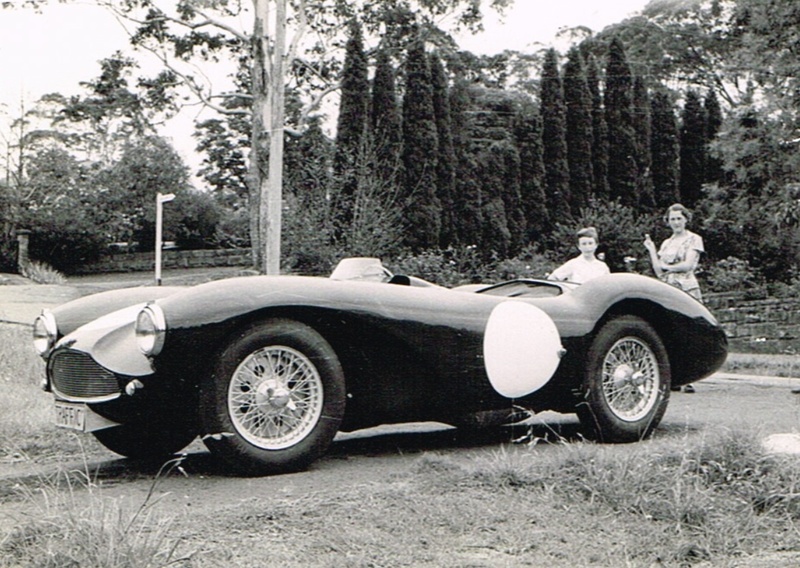 Feeley’s first work for the nascent AML was a roofless, rebodied Atom which ‘…was a sweeping open tourer derived from his pre-war ideas to modernise the Lagonda V12 and featured a new design of radiator grille. This had a vertically slatted centre section based on the original Aston radiator and a pair of low side grilles flanking it. Fifteen were built with the car retrospectively called the DB1’. 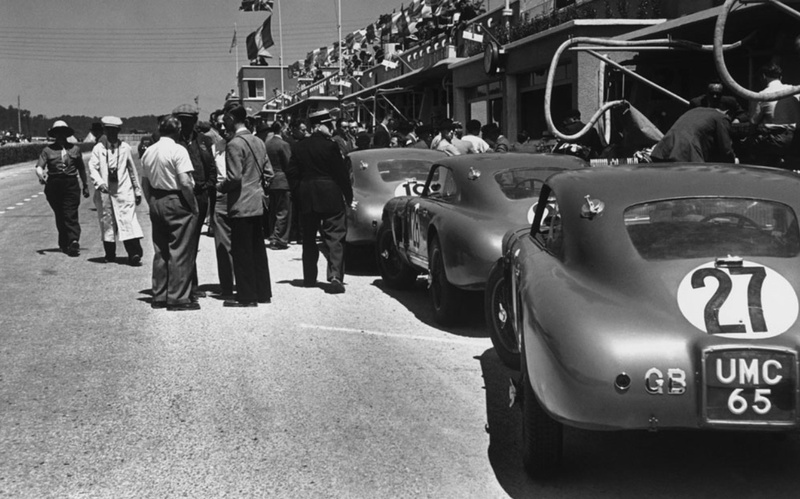 No doubt Cisitalia and Ferrari influenced the shape of the DB2 which was built on a shortened version of the Claude Hill designed ladder frame chassis- the car was created quickly to run at Le Mans in 1949. ‘We drew the chassis in and I immediately drew up the whole thing around it, the whole shape. Their was no time to change my mind once I had done it’ Feeley recalled. The DB2 continued the DB1’s three-piece grille form, in a simplified one piece design, which set the template for the Aston grille shape which continues today. The DB3S is favourite car for so many of us such is its purity of curvaceous line. Cutaway front arches were its innovation, the practical element of this approach was to draw heat out of the engine bay. ‘Feeley had got fed up with the chassis engineers never knowing where they were going to put the exhaust pipes, so he decided it for them by running the pipes through the cutaways’. By this stage Frank’s duties extended to managing the body-builders, initially Mulliners of Birmingham and later Tickford in Newport Pagnell, a David Brown acquisition. But times were changing, John Wyer was instrumental in the rejection of Feeley’s proposal for the coming DB4 in favour of Touring of Milan. This, and the concentration of activity at Newport Pagnell, where the DB4 was to be built, rather than at Feltham near Feeley’s home signalled it was time to leave. He worked in the aircraft industry and continued to live in his native Staines until his death in 1985. In terms of contribution post-war Feeley is up there with Astons best- Claude Hill, Harold Beach, Ted Cutting, Tadek Marek, John Wyer and David Brown himself. Not a forgotten man at all me-thinks?